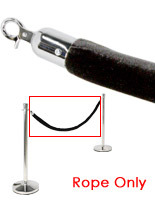 What makes these stanchions and ropes excellent choices when attempting to organize waiting patrons in an orderly queue or line? 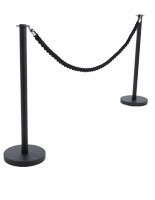 Durable metal stands and lines allow managers and staff to provide visible borders that separate guests and customers as needed. 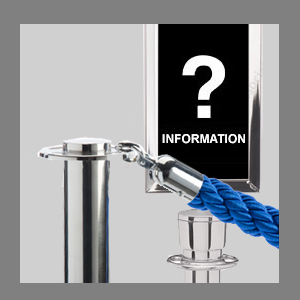 Keeping people arranged in a logical manner is an important part of receiving clients in any business or event location. 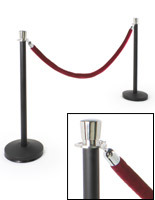 A single file line created by velvet belts makes any lobby, café, banquet hall or restaurant seem more fashionable. Our professional grade QueuePole line barriers add a bit of red carpet flair to any event or occasion. These elegant queue management kits prevent people from rushing toward the next open window or through entry doors. 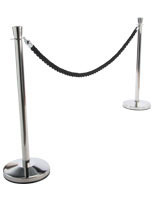 Twisted nylon or velvet stanchions and ropes, also known as portable barrier crowd control systems ensure that VIPs, or even the next customers in line, have a satisfactory event experience. 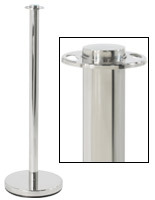 Many of our economy queue poles have steel construction to withstand frequent use. 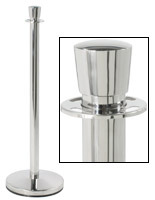 Metal models offer the elegance of traditional designs with attractive tops that complement any event or business setting. 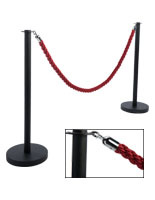 These high quality stanchions and ropes feature protective rubber bases that add stability and prevent against floor damage. 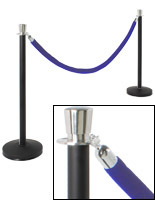 Four way receptor adapters at the top of the red carpet event accessories make it very easy to attach the velvet, velour, or nylon lines in any configuration. 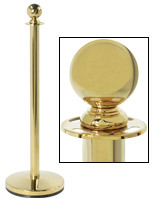 Chrome or brass poles combine security with style for impeccable results. 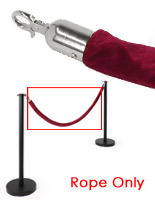 Are there any customizable options available with these crowd control barrier systems? 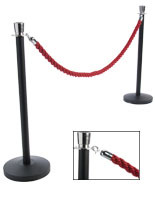 Commercial quality stanchions and ropes are available in many different colors and designs to complement any venue. 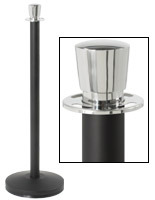 Silver, black, and brass finish posts are available with round, tapered or flat tops. All models are designed to work well at both high fashion red carpet and low key business scenarios. Velvet rope is available in various colors as well to provide the perfect accent to the posts as well as matching event or facility decor. 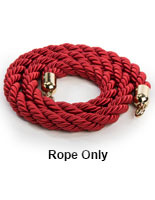 Burgundy and black offer a traditional look while commanding attention. 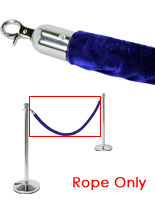 The hooks at the end of the belts have different finishes to match or complement the crowd control systems. 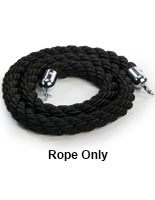 Some models include a rope while other poles are sold singly. Line divider queue poles include a four way adapter at the top for creating custom configurations. 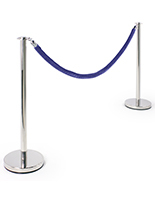 This makes it easy to organize straight or serpentine paths for customers to follow, or restrict access to specific locations as desired. A simple snap allows managers to quickly adjust the design to best accommodate the current wait. 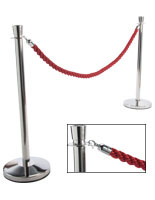 What types of establishments use crowd control rope systems? 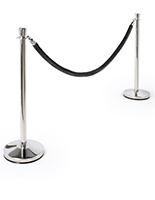 Event planners use line barriers at restaurants, bars, theaters, banquet halls or other large venues to control entry or restrict access. 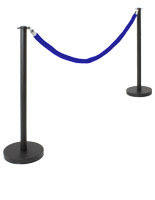 Depending upon the occasion, lay out designers may want to separate VIPs with exclusive locations. 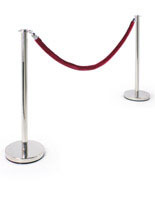 Traditional red carpet parties frequently use velvet ropes and poles to create a sense of exclusivity and build excitement, while separating attendees from onlookers. 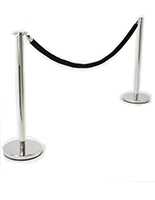 Museums and galleries use these easy to assemble queue barriers to maintain a safe distance between the general public and exhibits. 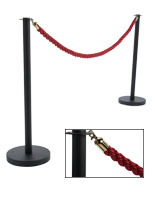 These post and rope sets prevent patrons from getting too close to precious paintings, sculptures, or other artworks, as well as organizing entry or exit areas. 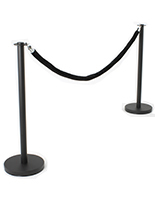 Banks and government buildings frequently employ line-based waiting accessories in lobbies to keep lines single file. These customizable kits let patrons know where the line starts and help service representatives process transactions smoothly and efficiently. Whenever a large group of people congregate in a single area there is a tendency for things to become disorganized. Our fabric and nylon barrier systems for sale can be set up quickly in configurations that work well within the surroundings. 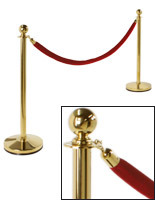 Tasteful velvet lines and ornate brass or chrome posts are popular choices when creating a VIP area or simply arranging waiting lines in a bank lobby or customer service area. Sets like these are available with sophisticated tops that will complement a simple party or red carpet gala. 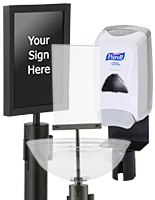 Many of the uprights can be used with post-top sign frames and other marketing accessories for advertising to those waiting in line. The sets are a gentle way of closing off an area or room from public access. 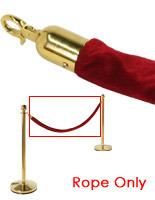 Patrons and crowds instantly recognize these party accessories and will follow the security implied. 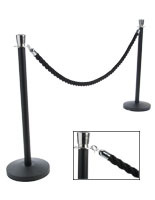 Each of the crowd control posts for sale here is made out of durable materials to offer stylish queue management for years. Weighted bases are crafted out of stainless steel and rubberized bottoms provide added stability while protecting flooring surfaces. 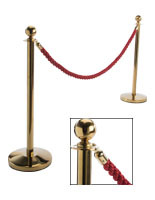 Poles are fabricated from metal with stylish brass, silver, or black finishes that complement any decor, while ropes are available in a wide selection of velour, velvet, and nylon colors that allow the barriers to blend or demand attention as desired. 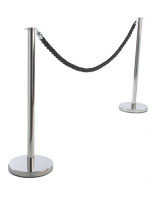 Line barrier crowd control systems are must-have fixtures for all sorts of businesses. 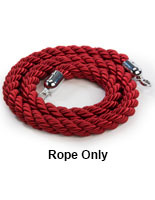 Our selection includes both economy and deluxe styles to fit any budget requirements. 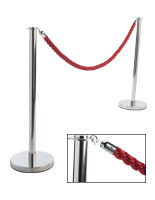 In addition, StanchionsDirect.com is constantly sourcing and creating new styles, color options and design that will match both the needs and the décor of any business or facility.